September | 2017 | Home: Free Sociology! I just can’t stay out of peoples’ bedrooms. With this post, I want to explore how bedrooms are getting used. Of course, we don’t have direct information about how people use bedrooms. But we can compare number of bedrooms to household size and get some sense of how empty or crowded rooms are likely to be. We can also compare bedrooms to household structure to get some sense of how creative people are being in filling up dwellings. More on that in a moment. First, let’s count some bedrooms! Here I’m counting bedrooms as “used” if there’s at least one household member per bedroom. I count them as “extra”, or empty, if they remain left over after after all household members have been given a room. Finally, I count a bedroom as “crowded” if more than two household members would have to share it. Below I count number of bedrooms by unit size. Once again, one thing that really jumps out here is the extent to which Vancouver is unusual in how many bedrooms are locked up in five bedroom, “Super Size” dwellings. Metro Vancouver is way outside the norm for Canada. By contrast, Metro Van has relatively fewer of the “Family Size” three bedroom dwellings that seem to be the workhorse for most of the nation. What about the counts? I count 459,994 extra bedrooms across Metro Vancouver, estimating that about one-fifth of bedrooms remain empty. Compare this to the 66,719 unoccupied dwellings counted across the metro area, constituting just over one-in-twenty housing units. There are other, less conservative measures of empty bedrooms out there,* but any way you look at it, we have way more empty bedrooms than empty homes. What’s also striking, though not especially surprising, is that the proportion of “extra” bedrooms rises with the total number of bedrooms in a dwelling in basically a linear fashion. So “Super Size” dwellings tend to have more empty bedrooms. By contrast, smaller dwellings have very few (those in occupied studio and 1BR dwellings, by definition, are always using all of their bedrooms). To put it differently, in Vancouver we have nearly twice the proportion of bedrooms remaining empty in 5 BR+ “Super Size” dwellings (28%) as have do in much smaller 2BR “Family Size” dwellings (15%). Again, this isn’t really a surprise: smaller dwellings are much more efficient ways to house people. BUT given that we’ve reserved so much land for big, land-consuming houses, and given that so many of these have been turned into “Super Size” 5BR+ mansions, how are the residents of Vancouver dealing with the situation? Are they getting creative? In my book, I detail the situation of one of my interviewees, a single mother who rented a mansion in a wealthy Vancouver neighbourhood. She couldn’t afford the place by herself, so she rented with a friend who was also a single-mother. Even together they still couldn’t afford the rent on their own, so to get by they also each kept boarders – mostly international students. I applauded the extremely creative way this mother figured out a solution to the housing situation she faced, re-purposing the “Super Size” mansion she lived in to make it work for her and a host of others. How much of this creativity goes on in Vancouver? Let’s explore household type by bedrooms for residents of Canada at-large and Metro Vancouver in particular. Here I’ve separated out in shades of drab gray the more boring kinds of households that we generally expect to find, including living alone, or living with a partner and/or children in a simple census-recognized family household. I’ve highlighted in color all of the more intriguing household combinations, including roommates, extended families, and everything in-between. Relative to the rest of Canada, Metro Vancouver demonstrates a lot more creativity in nearly every category, but it’s especially interesting how much creativity we see in filling up those “Super Size” mansions. Over 40% of residents are living in some kind of creative household, quite a bit higher than the 30% we see in the rest of the country. Lots of this may reflect the ethnic diversity of the Metro Vancouver area, and cultural practices more supportive of extended family living. But there’s clearly a lot of creativity going on in dealing with our housing shortage as well. To sum up, we could be building in a better way to house people instead of setting aside so much land for mansions, but we also see creative responses to the housing stock we’ve got. *-Empty homes have gotten a LOT of attention. Empty bedrooms less so. A previous analysis that gained some media attention in Vancouver estimated there were 800,000 empty bedrooms across the Metro Area. But the analyst assumed all couples shared a bedroom. I take a more conservative and simpler approach here that counts bedrooms as empty only if they exceed the number of people in a household. In other words: if everyone in a household gets their own bedroom, what’s left over? Adopting sharing rules definitely boosts estimates of empty bedrooms. Too Many Bedrooms, Not Enough Housing? So I’ve been playing around with bedroom data. Why? Because despite Pierre Trudeau’s famous dictum, “There’s no place for the state in the bedrooms of the nation,” we still collect data on how many bedrooms people have. And I’ve found some interesting stuff going on in peoples’ bedrooms! Following a theme, one thing that’s really intriguing is comparing housing stock by number of bedrooms across Canada’s Big Three Metropolitan Areas. For a rough bedroom comparison, we can divide up housing stock into “Economy Size” units (studio & 1BR), “Family Size” units (2BR to 4BR), and luxurious “Super Size” units (5 BR+). Let’s look at Montreal, Toronto, and Vancouver (and the rest of metropolitan Canada) across the past twenty years, comparing 1991 to 2011. Most housing stock is clearly in the “Family Size” category, containing 2 to 4 bedrooms. Montreal and Toronto look pretty similar in this regard, with about three quarters of their housing stock stably “Family Sized.” But look at Vancouver! Here only about two thirds of housing stock was “Family Size” in 1991, and as a proportion of housing stock it’s been dropping fast! When it comes to bedrooms, Vancouver really does have a “missing middle” problem. What’s taking the place of the missing middle? Tiny “Economy Size” shoe box apartments in the sky? Not really. Metro Vancouver has a lot of those, but they’ve also been on the decline as a proportion of housing stock since 1991. What about that “Super Size” housing? Hold on! That’s where Metro Vancouver’s been growing! In fact, it’s got way more giant mansions than any other metro area in Canada. But what about the housing crisis? What is Vancouver doing adding all of these crazy giant mansions? Good question! No surprise, mostly what we’re adding when we’re adding 5+ Bedroom housing units is detached single-family houses. In many cases, especially in the City of Vancouver, these are simply “Super Size” mansions replacing more modest “Family Size” houses. Here are the recently built (and occupied) housing units added in the five years prior to the 2011 Census. Notice nearly all new 5+ Bedroom housing units are single-family detached houses – or houses with a secondary suite (showing up as apartments or flats in a duplex). Why are we adding so many more of these? Effectively, it’s because houses are the only thing builders are allowed to construct on so much of our residential landscape. So big houses are mostly (over 80%) what takes up our residential land base. Welcome to Vancouver’s Great House Reserve! Of note, there are also a fair number of detached houses being added in “Family Size” housing stock, but overall the “Family Size” category is far more diverse in dwelling type, with lots of row houses and apartments in both low-rise and high-rise buildings (with the latter categories dominating the 2BR category!) In effect, there are LOTS of different structures that can support “Family Size” housing, most cheaper than detached houses because they use less land. But the cheaper kinds tend to be forbidden across the majority of our residential landscape. So relative to other metropolitan areas, we’re replacing “Family Size” with “Super Size.” Why? Because despite the progress Vancouver has made, we’re (still) reserving a whole lot of land for millionaires. So it’s no surprise that their super sized mansions are proliferating. Are all of our bedrooms getting used? I’ll come back to that in another post. Canada is a BIG country, with a lot of land. But it’s also an urban country, with most of its residents sticking to cities and towns (and suburbs) hovering just over the border from the United States. Over one third of Canadians live in Canada’s three big cities: Toronto, Montreal, and Vancouver. This is interesting for all sorts of reasons, but especially so for a housing scholar, because of the differing routes to urbanization taken by these cities. Their housing stocks, and correspondingly the way people live, are all quite distinct from the rest of Canada, and also distinct from one another. Here I’m just going to look at housing stocks in terms of dwelling types – i.e., what kind of building do you live in? Of note, I’ll also be treating the term “city” as inclusive of “metropolitan areas” as a whole, which is what we’re generally talking about when we say “Canada’s three big cities” (this is important, of course, because the City of Vancouver as a municipality, for instance, contains less than a third of its metropolitan population). So how do people live differently in Toronto, Montreal, and Vancouver from the rest of Canada and from one another? Let’s look at some data from Statistics Canada. The big difference compared to the rest of Canada is that the big three cities have far fewer residents living in single-detached houses. Less than half of residents live in houses in each of our major metropolitan areas, compared to well over two-thirds in the rest of Canada. But how has each metropolis managed its move away from the house? Montreal has developed a LOT of low-rise apartment buildings (up to four storeys tall) all throughout its old urban core. The rest of its housing stock looks a lot like the rest of Canada. On the whole, its a charmingly low-rise metropolis. Toronto has developed a LOT of high-rise apartment buildings (five stories and above), all throughout its old urban core. The rest of the its housing stock looks a lot like the rest of Canada. On the whole, its different mainly in its promotion of big, bustling high-rises. Vancouver lies somewhere inbetween Montreal and Toronto, insofar as it’s filled its urban core(s) with a combination of low-rise (often older) and high-rise apartment buildings. But it’s also distinct from either city in renovating and re-developing such a large proportion of its stock of single-detached houses, so that a LOT of them contain two or more dwellings (e.g. basement suites). To some extent, this last strategy speaks to Vancouver’s late-comer status. Montreal and Toronto are both relatively old cities, each having developed a sizable urban core before getting choked off by heavily protected single-family (RS) zoning in the twentieth century. Vancouver didn’t have that much of an older urban core to work with before most of its residential landscape became locked up by zoning. 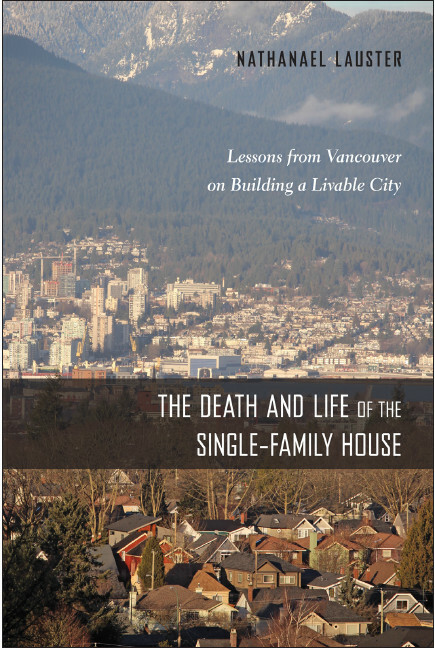 So many municipalities across Metro Vancouver have sneakily re-worked the definition of a “single-family residential” in their zoning by-laws to include a secondary suite – and often a laneway house too – enabling a very “gentle” form of baby-step densification. This is only part of the story of how the big three cities of Canada provide very different models for density and accommodating the move away from single-family detached modes of living. A related question we can ask is how housing gets distributed across the life course and history. I’ve been playing around with this from a descriptive standpoint, using age-graded distribution of housing. This is basically the same chart above, but played out across five-year age categories (except for under 15 and over 85, because these are the categories Stats Can gives me). It’s very clearly visible that outside of the Big Three Cities, single-detached houses are the statistical norm in Canada. They become a little less the norm during young adulthood (20-34) and for post-retirement ages (65+), but even so, more than half of the young and old alike live in houses. For Montreal, the house is not normative – less than half of people in any age category live in a single-detached house. Nevertheless, Montreal demonstrates the same general age-related pattern of house acquisition as we see in the rest of Canada. Young adults and older adults are especially unlikely to live in a house, turning instead to the plentiful low-rise housing (in the case of the young) or newer high-rise housing (for the old). What about Toronto and Vancouver? In Toronto, just over half of people live in houses across most age groups, but this figure drops sharply for young adults. Strikingly, there’s hardly any decline at all in this figure for older adults. In Vancouver, the figure overall is lower (<40% of people live in houses across most age groups). Nevertheless, the same age-related pattern pertains: though the young move out into alternatives, older age groups tend to hold onto living in single-family detached dwellings. What’s going on? In large part I suspect this is the result of generational shifts. Post-retirees in Toronto and Vancouver are probably transitioning out of single-detached houses like post-retirees elsewhere (Montreal and the rest of Canada) BUT they began their lives with much higher proportions living in single-detached houses than we see for later generations. (Perhaps you’ve heard that houses in Toronto and Vancouver used to be cheaper than they are now?) As a result, older residents in these cities continue to live in a much higher proportion of the detached housing stock than we’d otherwise expect. This also helps account for why many single-family residential neighbourhoods are shrinking! Controversy recently erupted over a new condominium housing complex being proposed in The Annex neighbourhood of Toronto. Ho-hum, pretty run of the mill situation, except that one of the complainants about the condominium was Margaret Atwood, who actually (and to her credit) responded to the many YIMBYs attacking her on twitter for NIMBYing new housing. A golden media moment! Most condominium dwellers (over 70%) are members of families. So as a first pass, it’s ridiculous to say families don’t live in condos. That said, it is true that condos support greater diversity in household members, including more people living alone or with roommates, than other kinds of tenure arrangements. It’s also true, of course, that people living alone and with roommates need housing no less than families. What do I mean by saying other tenure arrangement? Condos, of course, are a legal category of ownership, not a type of building. Towering apartment buildings can be condos, but so can low-rises, rowhouses (like mine), and even single-family detached houses. Condo units are mostly split – pretty evenly – between the first three of these housing types, covering about 90% of condominium units. But by the time I posted, the complaint had already turned away from ALL condominiums. The real problem is the NEW condos. New condos are (no doubt) more expensive, on average, than old condos. And often they’re built to maximize the number of units, minimizing the space in each, to provide lots of 1BR and Studio apartments, which appeal to investors, and relatively few 2BR+ apartments, which appeal more to families. These are all fair complaints. Indeed, a variety of cities (including Vancouver) have taken to mandating inclusion of 2BR+ condo units in many new developments. So here’s my updated chart. Do families live in NEW condos? NEW 1BR condos? NEW Studio condos? The answer is YES! Most NEW condo residents are family members (almost the same percentages as all condo residents). What’s even more striking is that most NEW 1BR and studio condo residents are still family members. That’s even a little surprising to me! But goes to show the adaptive ways people are doing family these days, even if often out of need rather than adventure. Even new 1BR and studio condos are supporting mostly residents who live in families. So if you’re keeping 1BR and studio condos out, you’re also keeping families out. But once again, and it bears repeating, residents who don’t live in families ALSO NEED PLACES TO LIVE! Along these lines, I also fixed an issue with my first figure, where “Person not in census fam” was treated as non-family. What this category actually represents in the Census is people who don’t live in an “official” census family according to the census (defined as parent-child or partner), but still live with family members. So for instance, siblings living together, or grandparents with grandchildren. I’ve moved residents in those kinds of households down to consider them as part of the “family” category here, because seriously… those are still families!